About Hotel: 4-Stories, 73-Rooms, Interior Corridors. 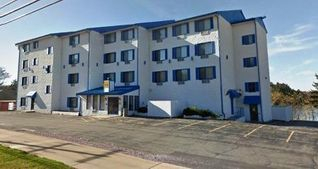 Amenities include our Indoor & Outdoor Pools as well as our Indoor Heated Hot Tub, Free Wifi, Free Laundry Facilities, Desk, Hair Dryer, Ironing board and iron, Microwave, Refrigerator, Coffee Maker, alarm clock and Sitting Area. Upscale bedding, 50 inch LCD TV, Temperature control units, Private bathroom for each unit, Daily house keeping services. Railroad View: Fair Distant View. 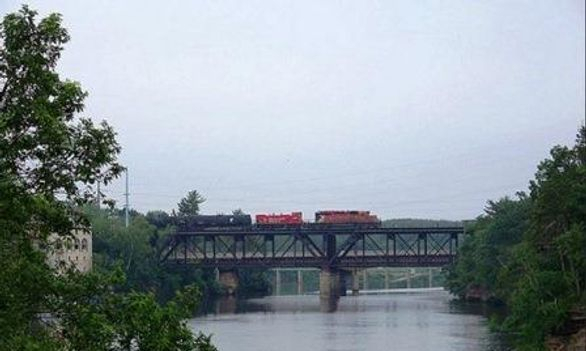 With binoculars or a really good zoom lens, from room balconies on the rear (overlooking the river), you will be able to see trains crossing the bridge over the Wisconsin River. Rooms with balconies are needed for the railroad view. There is no railroad view from the windows themselves. Railroad past Hotel: Canadian Pacific Railway (SOO Line). Notes: Former Mt. Olympus Santorini Village. Photo Comments: Dells River Inn provides a great view of the former Milwaukee Road double deck bridge from any room on the rear (river side of the hotel) that has a balcony on it. Photos of trains are easy from the balcony if you have a zoom lens. Make sure you have a scanner, trains sneak up on you fast here! Photo credit: Robby Gragg.